Rich attachment preview isn’t new to Exchange 2016. 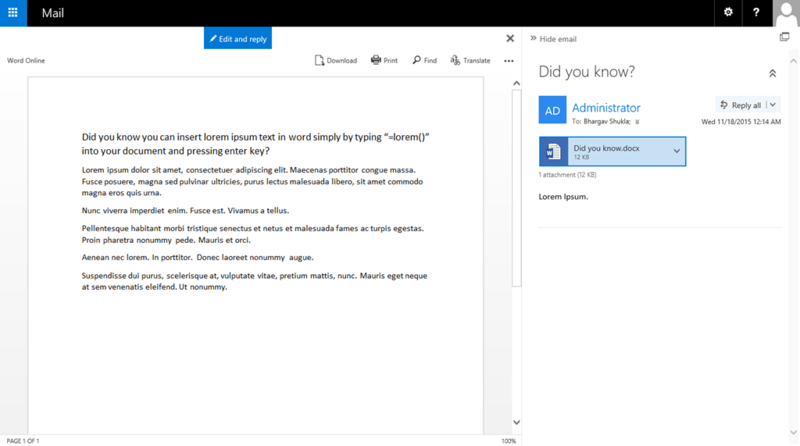 Exchange 2013 offered ability to preview Office attachments in browser window when using Outlook Web App. If you didn’t configure Office Web App server integration for Exchange 2013, check out this TechNet article. For Exchange 2016, a couple of things have changed. Namely, Office Web App server is now called Office Online Server which is currently in preview. 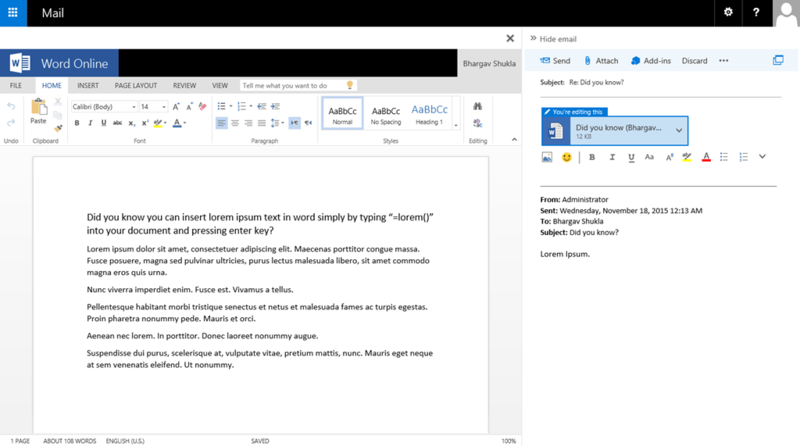 Outlook Web App is now known as Outlook on the web. When it comes to installing Office Online Server, it isn’t much different from Office Web App Server installation process. The process is documented here. While the article applies to preview version, I don’t expect it to change much. If you need to configure Office Online Server farm, you can check out my previous article. While it is written for Office Web App server, it is applicable to Office Online Server farms as well. You should also load balance the farm, which I documented previously as well and is still applicable. So assuming you have Office Online Server farm configured, let’s take a look at how to setup Exchange 2016 to work with it. Make sure the Exchange 2016 server can resolve URL oos.contoso.com and can reach the resolved endpoint on the network. This is why the TechNet article refers the URL as oos.internal.contoso.com. Now you have to let the change replicate, which may take anywhere from mere seconds to a while depending on your Active Directory configuration. The TechNet article also calls for restarting OWA App pool in IIS. I think that applies to those who don’t want to wait and I believe if you wait for configuration to be picked up automatically, you may not need to restart app pool at all. YMMV. Test it instead of hoping it will work in production. Well, so that was greenfield. What about the environment where Exchange 2016 is co-existing with Exchange 2013 servers? If you want rich attachment preview only on Exchange 2016 servers, run this cmdlet on Exchange 2016 servers and use Office Online Server farm url for discovery endpoint. If you are also want to enable rich attachment preview on Exchange 2013 servers, run the same cmdlet for Exchange 2013 servers and use Office Web App server farm url for discovery endpoint. NOTE: Set-MailboxServer cmdlet on Exchange 2013 servers does not have –WacDiscoveryEndPoint parameter. You must issue the cmdlet from Exchange 2016 server and target Exchange 2013 server to configure discovery endpoint. If you want granular control so that you can enforce in-browser viewing of attachments when user is on public or private computer, you can configure the setting per server by running Set-OWAVirtualDirectory cmdlet. You can read more details on this TechNet article. And lastly, if you are deploying Exchange 2016 across multiple datacenters, make sure to create unique namespace for OOS/WAC farm for each datacenter. This will help keep attachment preview related traffic local to where the user mailbox is active, improving performance. Check out document collaboration section on this article from Ross Smith IV on the Exchange Team Blog. Typo — OWA is **now** known as Outlook on the web. ? Hi, thanks for this how-to. I have setup Exchange 2016 and OOS (2016). I can view and edit documents in Sharepoint (2013) but in Exchange (2016) I can only view them. If I click on “edit and reply” a document copy is created and than I receive a RunTime error of OOS. In the Eventlog of OOS I haven an error dealing with illegal characters in the path… Any hints for me? If you are able to view the document in OWA, it rules out integration issue. Is editing allowed in OOS? IF same farm is used for SharePoint, I would assume the answer is yes. If so, I am afraid I don’t have more insight. In most cases it just works. I have yet to come against a case where viewing works but editing doesn’t (unless editing isn’t allowed on farm settings). Hi, Yes it is the the OOS-Farm for Exchange as also Sharepoint. The Exchange server does not come from the “green field”. Yes it is a new installation on a fresh server, but the Domain comes from 2013 and the Exchange 2016 took over… can this be some config probs? And Yes editing is allowed (for Sharepoint) is there another config for Exchange? Exception message: We couldn’t find the file you wanted. Is OOS farm able to access Exchange servers? Make sure integration is configured correctly. Sorry, there was a problem and we can’t open this document. If this happens again, try opening the document in microsoft Word. I have seen the error intermittently. My memory is failing me but IIRC, it was an issue with incorrect namespace (url) configuration.